Here at Jetpets we are big fans of bringing our pets to work, so we’ve rounded up some of the key benefits to encourage your workplace to embrace a pet-friendly work environment! 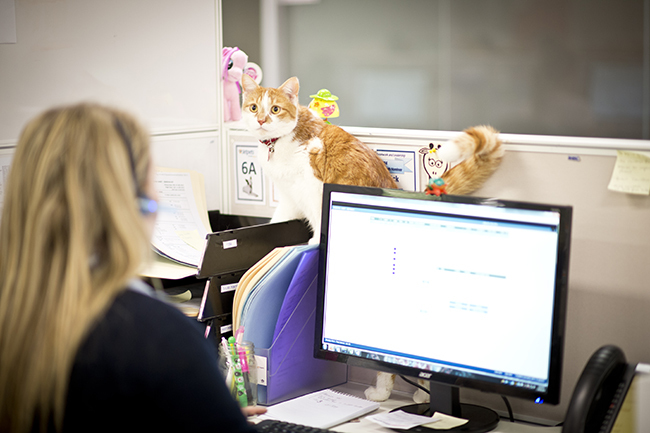 Did you know, having pets at work can actually reduce overall stress and anxiety? Having our furry friends around at work has been shown to increase happiness, productivity, creativity and work-life balance, so really, it’s a win win for everyone! Read on below for some more reasons why pets are great to have at work. If you have a pet, you will know that sometimes all it takes is to look into the eyes of your furry friend to feel instantly calmer and more relaxed. We turn to our pets after a bad day for comfort and love, so why not have that support in the workplace as well? A comforting look, or a quick pat or cuddle with our pets in-between our busy schedules helps to clear our minds and soothe us so we can get back to business. This is vital in the workplace when pressing deadlines, issues and conflicts can leave many people continuously stressed, limiting productivity, damaging the quality of work and increasing the chance of health problems. Animals in the workplace are great for acting as social catalysts, bringing people together who wouldn’t normally interact, creating teamwork and conversation. Studies have shown that co-workers who bring their pets to the office have a greater connection with their colleagues as it helps to increase trust, teamwork and friendship. Taking dogs to work encourages employees to take a break at lunch and to head outside to walk their pooches (so they get away from the dreaded and unhealthy desk lunch!) This helps to refresh the mind and get the body moving, so workers can return more focused and positive than ever! Exercising throughout the day is great for stress as it gets the endorphins going, clears the mind and adds a little fun into the daily grind. This makes workers more likely to be refocused and excel at the task at hand when they return! All of the above factors lead the way for greater creativity and productivity in the workplace, a vital part of any successful business. Thanks to the decrease in stress, clear refocused minds and greater sense of community, workers are more likely to be happier, productive and to work hard to get the job done! If bringing your pet to work seems a little daunting, try what we do at Jetpets and bring your pets to work every Friday for ‘Furbaby Friday’! There’s no better way to end the week!